Starwest Botanicals, located in Sacramento, California, USA, was founded in 1975 and has grown to become a principal supplier in the natural products industry. We are a manufacturer and processor of botanicals, herbs, and spices, with an emphasis on certified organic ingredients. We can supply ingredients ready for further processing, in-house blends, or custom blends. From start to finish, we can offer you complete manufacturing, processing, and blending services. 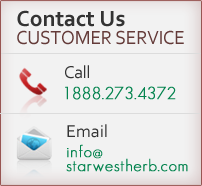 Serving the health food, nutritional supplement and cosmetic industries, including small manufacturing companies, we at Starwest Botanicals provide unmatched service and quality assurance by professionals with extensive industry knowledge and natural products expertise. Our extensive assortment of organic botanicals, herbs, and spices, can be offered in whole, cut, tea bag cut, and powder forms. We can supply quantities from 50 pounds to full containers. Starwest follows BRC protocol to comply with the Global Standard for Food Safety Initiative (GFSI). We first achieved BRC GFSI certification in 2015, and currently hold a AA rating. We are a Certified Organic Processor, certified by Quality Assurance International, and a Kosher Certified facility, certified by Kosher Certification Services. Most of our ingredients are kosher, and they are all non-irradiated.